Today, we’re looking at a combo of two of the badassiest threats in Sci Fi! Yeah, it’s not only a Borg, it’s also a Predator—what’s that? Oh, it seems I’m getting reports that this is not, in fact, a Predator. Apparently, it’s a Hirogen. What’s a Hirogen? Well, according to Memory Alpha, they’re “a nomadic species of hunters.” Are we sure they aren’t just Predators? Because they sound like Predators. Ah, what do I know? Let’s just look at the figure. The Hirogen Borg was officially designated 2 of 3 and was part of Art Asylum’s one-series wonder Borg: Assimilation. 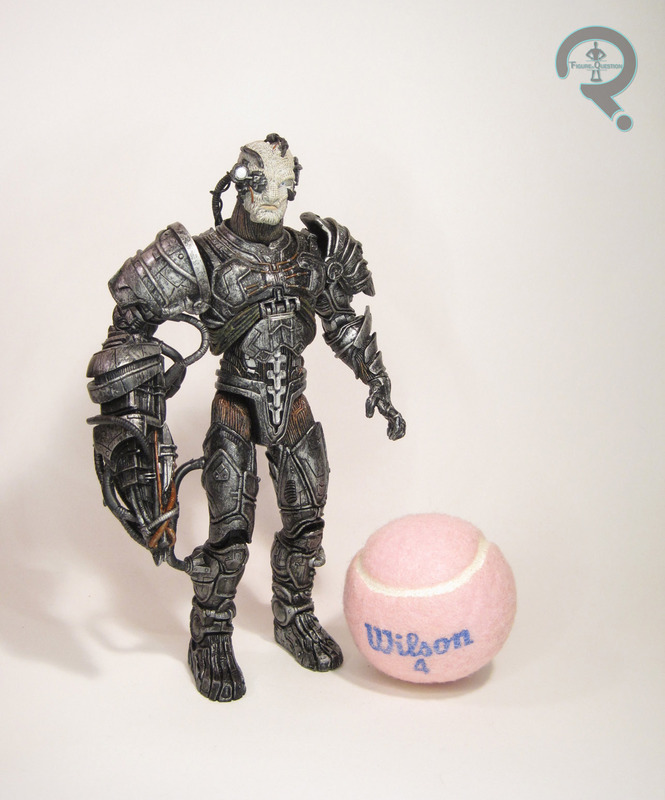 Fun fact: this borg-ified variant of the Hirogen is actually the only Hirogen action figure in existence. Yes, even in all of Playmates’ insane coverage of the license, they never ever made a single Hirogen. I think that speaks to the obscurity, right? Or to the fact that they were on Voyager. Either way, no prior figures. 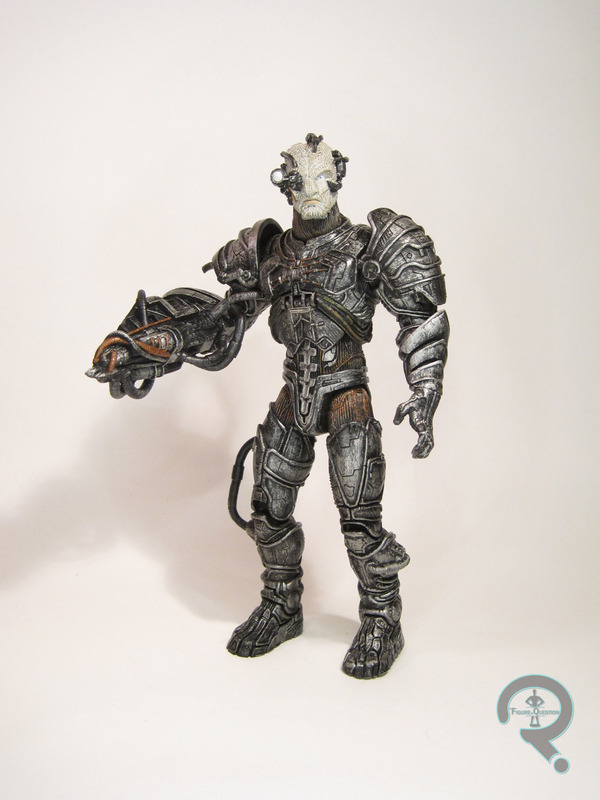 The Hirogen is the tallest of the three Borg figures, at 8 1/4 inches tall. He’s also got 17 points of articulation. The sculpt is once again all-new, and very, very impressive. In particular, the texture work on the face is really sharp. In terms of design, the Hirogen Borg is far more symmetric than the Klingon. There’s still some definite asymmetry in a few spots, but by and large he’s a lot more balanced than the last figure. His stance is also straighter, which is another nice change, helping to sell the differences between the two species. He still keeps the slight stylization present on the Klingon, which is nice for consistency’s sake, and I believe makes for the superior sculpt. As with the Klingon, the paintwork on the Hirogen is monochromatic, but still very much top-notch. It’s impressive the kind of range AA was able to pull out of variations on silver and grey, but they certainly did a lot. He’s a little cleaner looking than the Klingon, which once again seems to fit with the stylistic differences they were pushing with the sculpt as well. Like his Klingon compatriot, the Hirogen’s only accessory is the weird coin thing, but, once again, he’s hardly hindered by it. Though I certainly checked out the Klingon figure when he was new, the Hirogen didn’t even cross my radar. Chalk it up to me knowing nothing about the Hirogen in the slightest. Upon seeing the full set of three figures in person, the Hirogen actually stood out to me the most of the three, and in hand he’s definitely my favorite of the bunch. Not bad for a figure of a race I didn’t know a single thing about until a month ago.